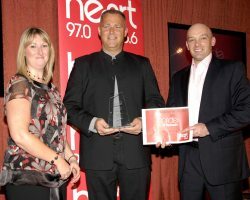 We are delighted to announce that Security Management South West Ltd last night won a Heart FM Pride of Plymouth Award as Employer of the Year. Held each year, the Pride of Plymouth awards highlight outstanding businesses and individuals from the Plymouth community who have “…gone above and beyond the call of duty”. According to Job Centre Plus, what probably got so many people to vote for them made Ken York and Jay Morrish, Directors of Security Management South West the winners was: “We would like to nominate Ken York and Jay Morrish at Security Management South West (SMSW) for the care and attention they have shown long term job seekers in Plymouth and Devon. SMSW have built relationships with public and volunteer organisations to make their vision of providing lasting and supportive employment to jobseekers with serious barriers to work including incapacity, lone parents, poverty, learning difficulties and drug and alcohol misuse. Hear, hear! We agree! And Entrepreneurs Bootcamp™ is especially proud of Ken and Jay. We first met Ken when he applied to come on the 2007 Entrepreneurs Bootcamp™. He had some great business ideas but we didn’t have a 12th sponsor to enable him to attend the 5-Day Bootcamp, so the Bootcamp’s host company Pragmatic Performance Group provided mentoring support to SMSW as the Bootcamp’s “12th man”! These guys know just how to balance the business needs with ensuring their staff are looked after, so they are worthy winners of this Employer of the Year award. « Day 1: Bootcampers vs Tigers!